Prepare spice rub: Mix coriander, salt, and red pepper. Place chicken into a large gallon Ziploc bag, and add the spices – rub the spices into the chicken (using the bag) and chill for at least 6 hours or overnight. Make the marinade: Combine orange juice, bourbon, brown sugar, honey, jalapeño, and shallot in a medium saucepan. Bring to boil, stirring until sugar dissolves. Reduce the heat to medium-low, and simmer until mixture thickens slightly, about 10 to 15 minutes. Add more jalapeño and/or sugar, if more spice or sweetness is desired. Allow to cool for at least 1 hour (note – may be made 1 day in advance). Place the chicken thighs into the marinade the morning-of preparation – they should marinate for no more than 10 hours, max. 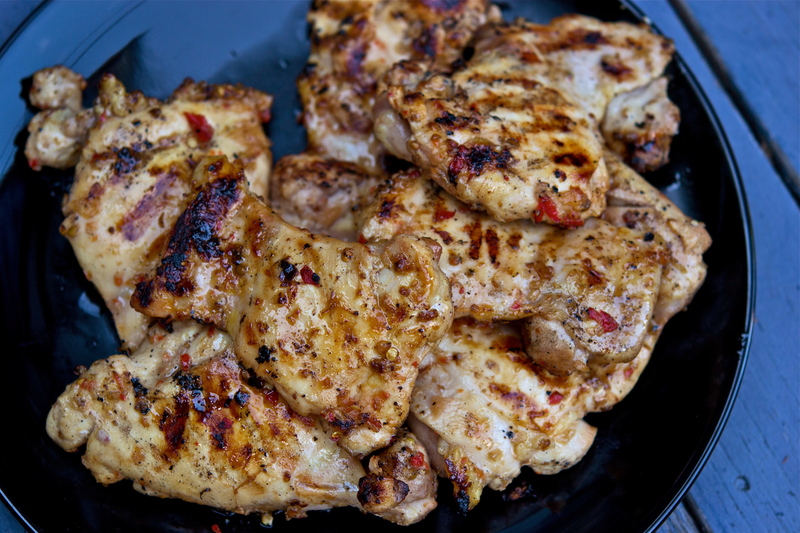 Cook the chicken: spray your grill with nonstick spray, and preheat to medium-high heat. Arrange the chicken on the grill. Grill for about 5 to 7 minutes per side, turning occasionally. Allow to cook until juices run clear when pierced with fork, or until instant-read thermometer inserted into chicken registers 170°F (Chicken may also be prepared in a stovetop grill pan, or underneath the oven’s broiler). Transfer to a platter and serve immediately.